Our ever popular Jack the Joker fundraiser continues this Sunday night in Minnies Bar where the jackpot is €8,200 as on Sunday night last Paddy King was drawn out of the drum and chose card number 29 which wasn’t the Joker although he did win €50. Michael O’Donovan and B. Carroll won €25 each. As well as our group of ticket sellers tickets can be purchased from Convenience Store Ballinroad, Village Flowers, Spar, Mousies Takeaway, Minnies Bar and Crotty’s Corner Bar. L to R: Brendan, Tony, Michael, Moira & Caroline Mansfield. This week's photo comes from 1989 and shows the Mansfield family at a club presentation to Tony in recognition of his achievements as manager of the Waterford Senior Hurling team. CLG Dún na Mainistreach / Baile na Cúirte would like to wish all its members and supporters, at home and abroad, a very Happy Christmas and best wishes for 2016. Our ever popular Jack the Joker fundraiser continues this Sunday night in Minnies Bar where the jackpot is €8,000 as on Sunday night last Brian O’Connor was drawn out of the drum and chose card number 49 which wasn’t the Joker although he did win €50. Michael Cosgrave and Jim Egan won €25 each. Tom Tobin, Kevin Tobin, Siobhan Murray and Emma Flynn all won €25 in the extra Christmas Draw. As well as our group of ticket sellers tickets can be purchased from Convenience Store Ballinroad, Village Flowers, Spar, Mousies Takeaway, Minnies Bar and Crotty’s Corner Bar. On behalf of all our club members we would like to welcome home all those who have travelled home to Abbeyside for the Christmas holidays, especially those who are returning home from abroad. 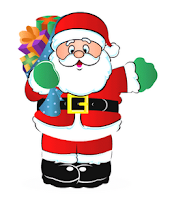 Also we would like to send Christmas wishes to the editor and staff of the Dungarvan Observer and Dungarvan Leader and to thank them for all their help and assistance throughout the year. Nollaig Shona agus athbhliain faoi shéan ‘s faoi shonas daoibh go léir. On Saturday night last a very enjoyable function took place in The Gold Coast Hotel to mark the 50th anniversary of the club winning the County Intermediate Football Title and take our place in the ranks of Senior Football for the first time. It was great to see so many people in attendance and all agreed that it was a very enjoyable evening. On behalf of all in the club we would like to congratulate Martin Lavan and Emma Coleman who were married last weekend. We wish them both many years of happiness together. There will be no club bingo this Sunday night and it will resume on January 3rd with a jackpot of €550. 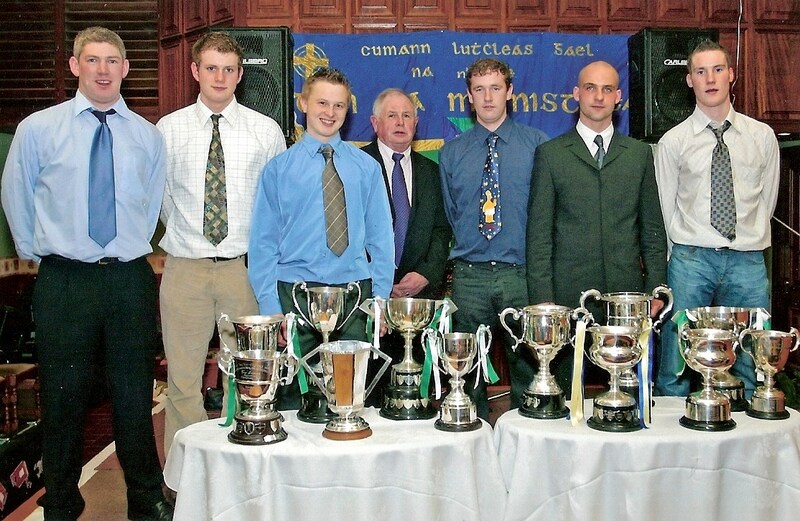 Abbeyside / Ballinacourty GAA Club will be a host club for Féile na nGael in June next year. 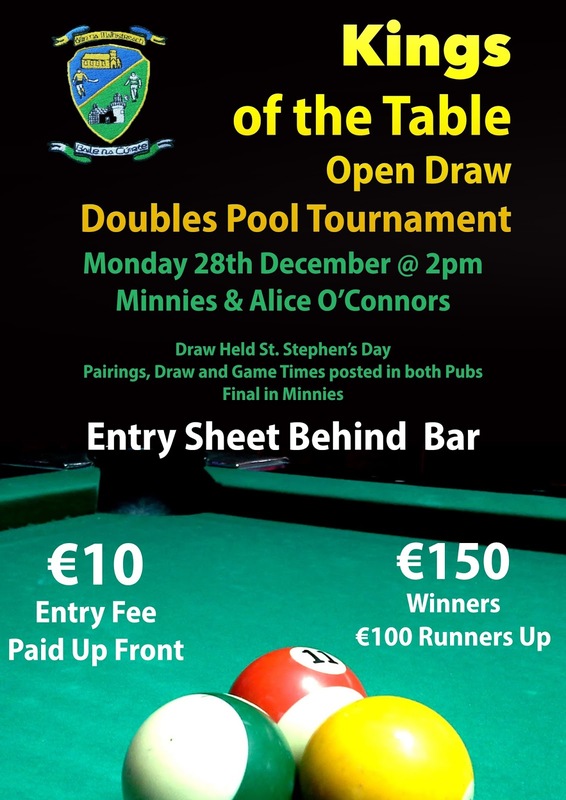 On Monday, 28th December the club will be running a doubles pool tournament to help raise funds for the event. Entry fee is €10 per person. Please see poster below for details. 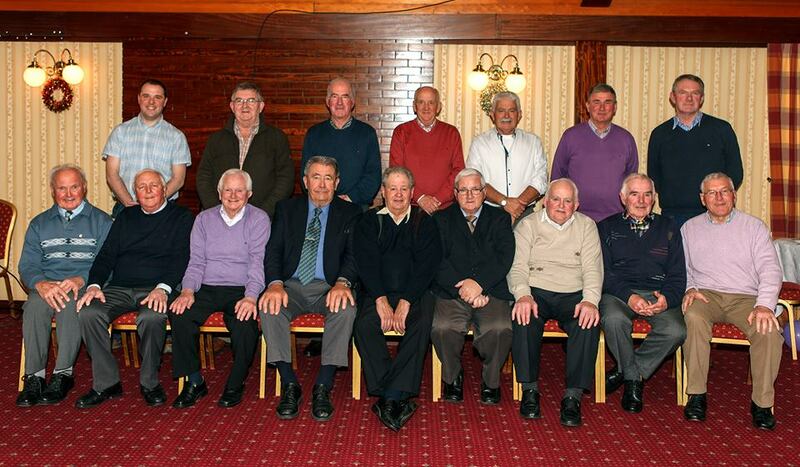 On Saturday night last at the Gold Coast Hotel a very pleasant function took place to honour the Ballinacourty team that won the County Intermediate Football Championship in 1965, 50 years ago. 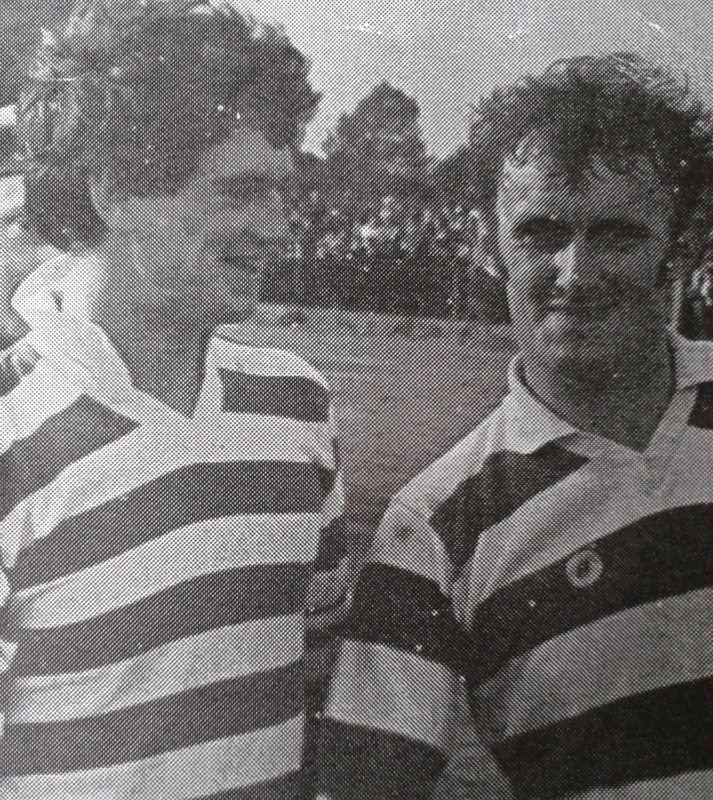 The comprehensive 3-9 to 1-0 win over Rathgormack saw the club promoted to the senior ranks for the first time. It was great to see so many of the players looking hale and hearty on the night while thoughts were also of those who have gone to their eternal reward since that breakthrough victory. Thanks to all involved in organising such an enjoyable occasion. 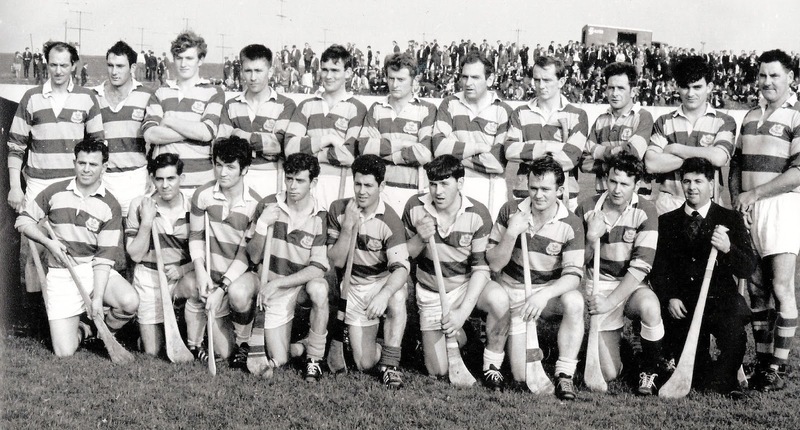 This week's photo shows the Abbeyside team that was defeated by Mount Sion, 7-11 to 2-13, in the 1969 County Senior Hurling Championship Final played at Walsh Park in October. 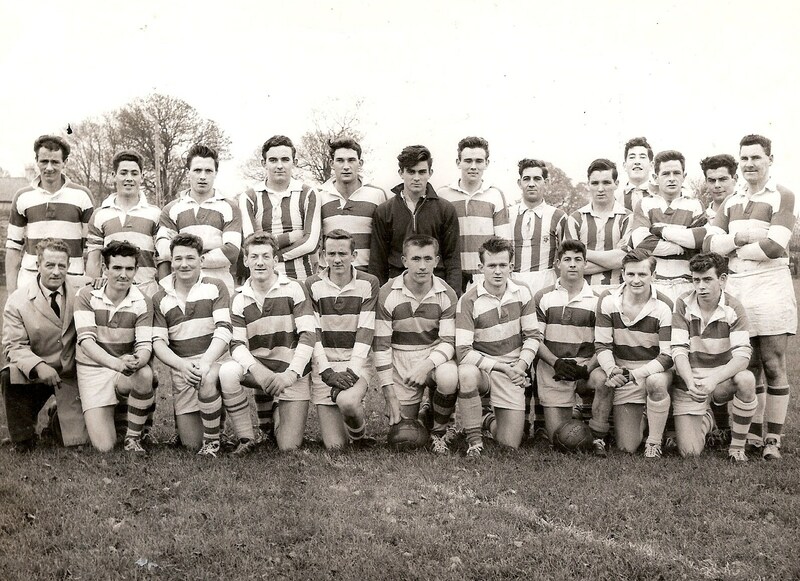 At half time the Villagers led by 2-10 to 3-5 before the city men took charge and inflicted our fourth defeat since 1955 in a hurling decider. On Thursday night last, our club welcomed the Wanderers Australian Rules U15 and U16 teams to the Burgery for two games under lights against Ballinacourty's age equivalent players. The rules were a hybrid of Gaelic Football and Australian Rules and the games proved to be very entertaining with tremendous skill on display from both panels. Three of the four quarters were played with the round ball while the final period saw the oval ball being used. We would like to thank the Australian players, mentors and parents for their visit and wish them a safe journey home. Thanks to Audrey Hallahan for providing us with the photos below which are a wonderful record of the event. Our ever popular Jack the Joker fundraiser continues this Sunday night in Minnies Bar where the jackpot is €7,600 as on Sunday night last Eleanor Hickey was drawn out of the drum and chose card number 22 which wasn’t the Joker although she did win €50. Jane and Wayne and Ken and Jim won €25 each. As well as our group of ticket sellers tickets can be purchased from Convenience Store Ballinroad, Village Flowers, Spar, Mousies Takeaway, Minnies Bar and Crotty’s Corner Bar. Our Annual General Meeting took place in St Laurance’s Hall, Ballinroad on Friday night last. Chairman Bernard Shields got the meeting underway by welcoming all those present after which Treasurer Packie Hurney presented the Club Accounts which showed that once again the club to be in a good a financial position despite paying back the loans on our development work. Packie was praised for the work he put into not alone preparing the accounts for the AGM, but for the work he put into the club finances all year. Next on the agenda was the Secretary’s Report and once again Jonathan O’Donovan produced a very detailed report on all areas of club activity during 2015. All in the club are aware of the many hours put in by Jonathan in administering the club business and we are fortunate to have somebody so diligent carrying out this role. 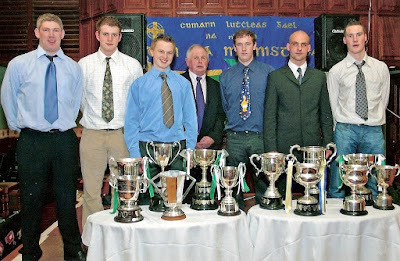 Committee: Niamh Enright, Pa McGovern, Jim O’Mahony, Audrey Hallahan, Joe Cleary, Brendan Mansfield, Michael O’Donovan. This Sunday our Bingo will continue in the CBS Hall where the Jackpot is €400. On behalf of all in the club we would like to send our deepest sympathies to the family and many friends of the late Kathleen Woods (nee Organ), Shears Street, Abbeyside who passed away last week. Kathleen’s family has many connections with our club for generations on the playing field and they continue to support the club today. 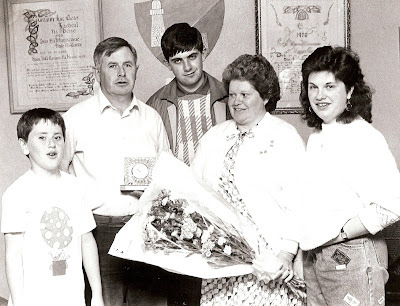 Once again we send our sympathies to Kathleen’s husband John, daughter Patricia and son Seán on their loss. We would also like to send our sympathy to the family of the late Kevin Keating, Leamybrien who passed away recently. Kevin was a familiar face to the field workers in the club as he often helped out with maintaining the machinery in the field. Congratulations to Patrick Hurney and Conor Prunty on being named Adult Footballer of the Year and Underage Footballer of the Year for 2015 respectively at last night's Waterford GAA Awards held in Lawlor's Hotel. This is the first time that both awards were won by club members in the same year and are fully deserved recognition for the excellent performances put in by Patrick and Conor throughout the year. 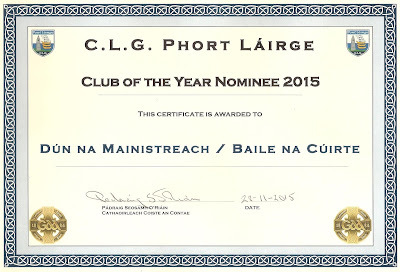 The club was also nominated for Club of the Year. This was won by Ballygunner. 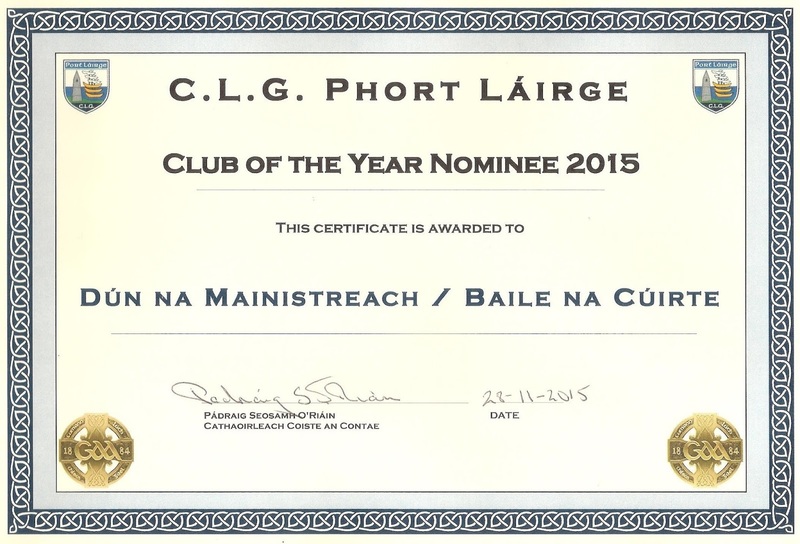 Our AGM takes place on Friday night next, 4th December at 8:00pm in St. Laurence's Hall, Ballinroad. All are invited to attend. This week's history slot looks back at the AGM of 40 years ago and shows the officers and committee elected to serve the club in 1976. Vice President: Fr. N. O'Mahony, C.C. 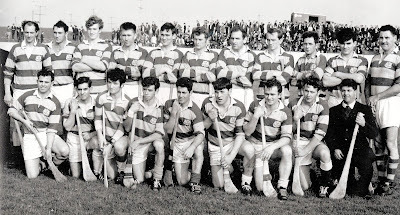 Committee: T. Mansfield, N. McGovern, L. Enright, V. Mulligan, Seán Fitzgerald, K. Lennon, Séamus Fitzgerald, M. Organ, D. Whelan, T. Regan, S. Feehan, M. Hogan. Our ever popular Jack the Joker fundraiser continues this Sunday night in Minnies Bar where the jackpot is €7,200 as on Sunday night last Maurice O’Donnell was drawn out of the drum and chose card number 8 which wasn’t the Joker although he did win €50. Sawdust and Neil Moore won €25 each. As well as our group of ticket sellers tickets can be purchased from Convenience Store Ballinroad, Village Flowers, Spar, Mousies Takeaway, Minnies Bar and Crotty’s Corner Bar. Our Annual General Meeting will take place in Ballinroad Hall on Friday night, December 4th at 8pm. This Sunday our Bingo will continue in the CBS Hall where the Jackpot is €1550. The final under age fixture for the year in the club was concluded on Sunday morning last with a 3-7 to 0-8 win for our Under 15 hurlers against Roanmore, to win the Division 1 County Title. This was a close contest for most of the game with us leading by a point at half time. In the second half our lads played some wonderful hurling to win well in the end. Well done to all the players and mentors that were involved. A word of thanks must go to the parents of the team for their support throughout the year driving to training and to matches etc. Everyone can now enjoy a short break before play for this group resumes early in the New Year. Congratulations to Garranbane NS who recently won the Schools A Football Western Championship against Ballymacarbry NS. 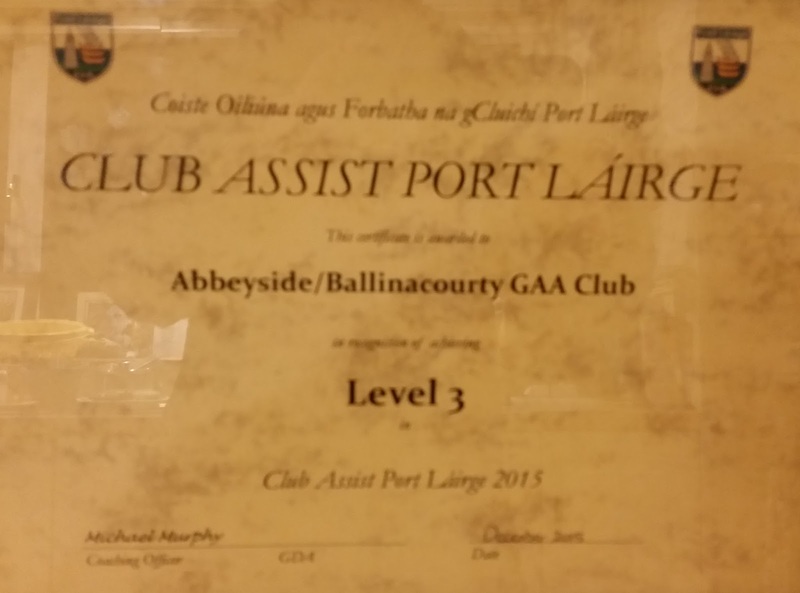 This was a wonderful achievement by all involved and they were due to play the county final yesterday (Tuesday) in Abbeyside against Ballygunner. At the time of going to print however the result of this match was not available but will be included in next week’s notes. A big thank you must go to all the teachers involved in our parish schools who put so much time and effort into the promotion of our national games in their respective schools. A big thank you to all who supported our table quiz on Friday last to raise funds for the upcoming trip of two Australian rules teams. We would like to thank all those who put together a table for the quiz and all those who donated a spot prize on the night. Also we would like to thank our host on the night Brendan O’Brien for going about his work in his usual professional way. Also thanks to Pat O’Brien in Minnies for providing us with a venue on the night. Well done to all concerned for a fantastic year. Further to last week's photo, today we show the scroll awarded to Abbeyside / Ballinacourty GAA Club for being named Waterford 'Club of the Year' in 1970. This was the second year in a row that the award came to the Village. Our ever popular Jack the Joker fundraiser continues this Sunday night in Minnies Bar where the jackpot is €7,000 as on Sunday night last Jimmy Lenihan was drawn out of the drum and chose card number 12 which wasn’t the Joker although he did win €50. Marian Kiely and Carmel and Jim won €25 each. As well as our group of ticket sellers tickets can be purchased from Convenience Store Ballinroad, Village Flowers, Spar, Mousies Takeaway, Minnies Bar and Crotty’s Corner Bar. On Friday night last we were defeated by our neighbours Dungarvan in the Semi Final of the Western Championship. We would like to thank our young squad and management team for their commitment throughout the year, where they won the Western Football title. TEAM: L. POWER, C. McCARTHY, B. LOOBY, M. COLEMAN, R. CONWAY, J. DUGGAN, E. BERGIN, C. PRUNTY, D. SWEENEY, E. KIELY, M. MAHER, N. MONTGOMERY, D. McGRATH, S. DALY, S. CLIFFE. SUBS: K. DWANE, J. BERESFORD, S. O’GORMAN, P. COLLINS, D. LOOBY. This Sunday our Bingo will return to the CBS Hall where the Jackpot is €1500. We would like to thank all those who supported our Monster Bingo in the Park Hotel last Sunday and the staff of the hotel for all their assistance on the day. On Sunday morning last we travelled to Old Parish for the Western Under 15 Hurling Final against a gallant St Oliver’s outfit. There was a late venue change as the Fraher Field had played host to many games over the previous twenty four hours. It was a very windy morning in Old Parish and conditions for hurling were far from ideal. However from the start our lads adjusted better to the conditions and over the hour played some good hurling. We won on a score line of 5-9 to St Oliver’s 0-7 in the end. Well done to everyone on the panel and to the selectors who have given up much of their valuable time to help this group over the years. We now go on next Sunday morning to face Roanmore in the County Final at an Eastern venue which has yet to be decided. Good luck to all involved again. 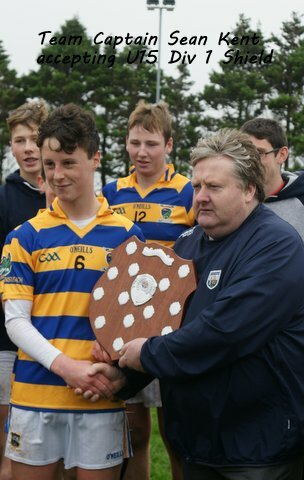 Congratulations to our U15 panel and management team on their fantastic 5-9 to 0-7 victory over St. Oliver's in the Western U15 Division 1 Hurling Final at Old Parish this morning. Played in extremely difficult weather and underfoot conditions, the lads led 1-6 to 0-4 at half time. This win completes a divisional double at this grade, the football title secured earlier in the year. The County Final takes place on Sunday next against Roanmore. The venue and time will be confirmed during the week. 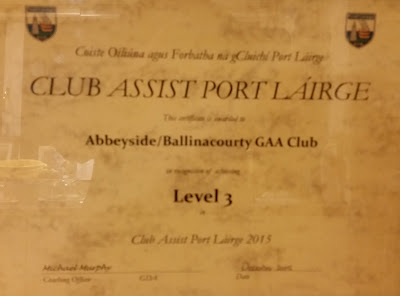 On Monday evening last Abbeyside / Ballinacourty was nominated for Waterford Club of the Year, 2015 along with Ballygunner, Modeligo and Stradbally. Our photo this week shows the commemorative scroll awarded to the club following its selection as Club of the Year in 1969. This was the first occasion that the club received this honour. Further victories came in 1970, 1979, 2003 and 2007.